R‑Studio allows you to create and process very complex custom RAID layouts. Check that the Apply changes immediately check box is clear on the Parents tab. This will prevent R‑Studio from trying to start processing the RAID configuration until you specify it completely. These objects may be hard drives, logical disks, or images. Check that the objects are correctly placed. Disregard the Block order for field. The Block order table will expand. Use the RAID Sequence window to move from one row to another. Using the keyboard : arrow keys to navigate, digit and p keys to enter the block order. Using the mouse : right-click the cell and select the number or parity from the shortcut menu. If the block table is too large, you better use the keyboard to enter the digits. Corrections : R‑Studio will tell you if some digits are not correct . Navigate to the required cell and enter the correct value. Use the Delete key to clear a cell. Clear the table : Right-click the table and select Clear all on the shortcut menu. If R‑Studio detects a valid file system on this RAID object, a partition object will appear on the Drives panel. Another example is a RAID with the following layout, similar to that used in Mac Pro internal RAID cards with 4 hard drives. As you see, this layout cannot be fit directly into a standard 2D block order table. Still, it's possible to create such RAID layout using the RAID Sequence window. Disregard the Block order field. 6 Right-click Cell 1 in the block order table and select Create New Sequence . 7 Right-click Cell 2 in the block order table and select Add to Sequence, do that for Cell 3, too . 8 Right-click Cell 4 in the block order table and select Create New Sequence . 9 Right-click Cell 5 in the block order table and select Add to Sequence, do that for Cell 6, too . 10 Select the first line in the RAID Sequence window, right-click Cell 1 in the block order table, and select Parity of Data. 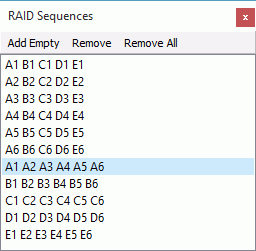 If any unnecessary sequences appear, right-click them in the RAID Sequence window, and select Remove. 11 Right-click Cell 2 in the block order table and select 1 , do that for Cell 3 selecting 2 . 12 Move to the next sequence in the RAID Sequence window and repeat the procedure for cells 4, 5, and 6. Do that for the rest of the sequences until you fill all cells in the block order table in the Parents tab . Rows from 1 to 5 use two types of error correction: parity of data (xor) and Reed-Solomon. That is, row 1 uses blocks A1 and E1, row 2 uses blocks D2 and E2, and so on. Row 6 is used for error correction for columns. That is, column A uses block A6, column B uses B6, and so on. Parity of all is used for error correction. Disregard the Block order parameter . Note: You should specify an error correction block only when the correct sequence is selected on the RAID Sequences window. Using the keyboard : arrow keys to navigate, digit, and rs, pd, pa, u, i keys to enter the block order. Select the required row sequence on the RAID Sequences window, select the cell on the RAID table, and enter the required value. R‑Studio automatically generates those sequences when you add RAID parents. You need to create those sequences and add the respective blocks to it manually. To create a sequence: Click Add empty on the RAID Sequences window or select Create New Sequence on the shortcut menu on the Parents tab. To add a block to a sequence: Right-click the respective cell and select Add To Sequence on the shortcut menu on the Parents tab. To remove a block to a sequence: Right-click the respective cell and select Remove From Sequence on the shortcut menu on the Parents tab.